Does your child own a tablet or smartphone? Mine does, and while I like to think we’re pretty good with limiting and monitoring her online time, it wasn’t until I started reading about internet safety for kids that I realized we were barely scratching the surface. 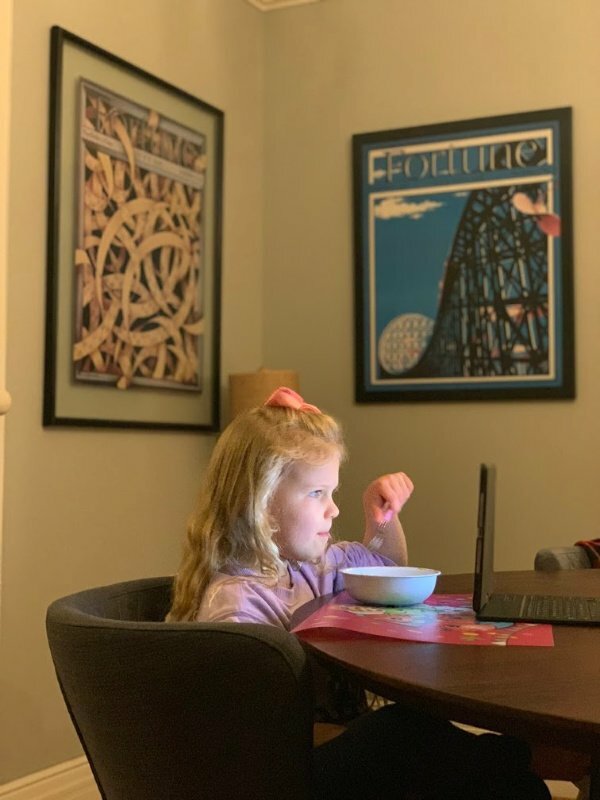 Our almost 8-year-old spends most of her allotted electronic time watching toy unboxing videos on YouTube, and since we have parental controls in place and she knows she’s only allowed to watch videos from the channels she’s subscribed to, I figured we were covered. I assumed we didn’t need to have a deeper conversation about internet safety until the teen years when our sweet girl starts begging for her own social media accounts, so I completely put it out of my mind. But then she asked if she could download a game her BFF likes to play, and while we were getting her setup in the app, I realized it was an online game that allows players to play and chat with one another in real time. This was a total game-changer for us and forced me to get serious about internet safety for kids. While I want my daughter to adopt and embrace technology, we were crossing into uncomfortable territory for me and I knew the time had come for the 3 of us to sit down as a family to create healthy digital habits and discuss how to be safe and smart online. As luck would have it, Tuesday, February 5th, 2019 is Safer Internet Day (SID), and Google’s Kids and Families team has created a NEW Family Guide with a super fun interactive app called Interland, which is a hands-on, adventure-packed online game that visually teaches kids about internet safety. 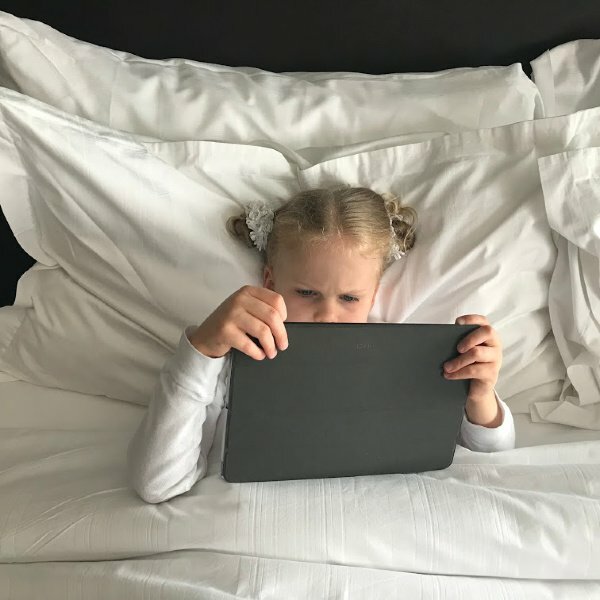 There is so much to think about, and I’m so excited to team up with Google and Forward Influencer to help raise awareness about internet safety through Google’s Be Internet Awesome tips and resources, as well as this super-helpful Family Link app to help parents monitor and control how their children spend their time online. In honor of this year’s Safer Internet Day, Google’s Kids and Families team has created a NEW Family Guide, which is full of all kinds of helpful tips and ideas to help you create healthy digital habits and discuss how to be safe and smart online with your children. You can access all of the info HERE, and I’ve summarized the key discussion points below. Be a positive presence online. Everything that is posted about you online – whether by you or by someone else – could last forever. Think before you post. Again, anything you post online could last forever, so be smart about how you respond to things you see, and don’t share something that isn’t true. Protect your secrets! Don’t share anything private, like your address, email, phone number, usernames and passwords, or any other documents and materials online. Don’t assume that people online will see you the way you think they’ll see you. Things that are written online aren’t always perceived the same way by everyone, so be careful with what you say. It’s always important to respect other people’s privacy choices, even if they aren’t the choices you’d make yourself. As I always tell my daughter: do what’s right for you and allow others to decide what’s right for them. Create a strong password. Your passwords should have a least 8 characters, should use a combination of upper- and lowercase letters, and should include numbers and symbols. Switch it up. Create a separate password for each online account for greater security. Get creative. Don’t use a password that’s easy to guess, like your name, your pet’s name, your favorite color, or a series of numbers like 123456. Avoid getting personal. Don’t use personal information like your name, address, phone number, social security number, birthday, mother’s maiden name, etc. in your password. Don’t hesitate to change your password. If you suspect someone other than a trusted adult like your mom or dad may have figured out your password, make sure to change your password immediately. Double check for site credibility. Before clicking on a link to a site, make sure the URL matches the name of the product or company you’re searching for. Use secure websites. Make sure each website you visit has a URL that starts with ‘https://’ and has a little green padlock to the left of it. Don’t fall for scams. If an email or website is offering you something that seems too good to be true, like a million dollars, it probably IS too good to be true, so don’t fall for the scam! It can happen to anyone. If you do fall for a scam, don’t fret. Tell a trusted adult like your mom, dad, or teacher immediately and change all of your online passwords straight away. Remember that websites and ads cannot tell if there’s anything wrong with your device! Certain scams try to get you to download malware or unwanted software by tricking you into thinking there is something wrong with your device. Never click on these! Follow the golden rule! Remember to treat others the same way you want to be treated, both online and offline, and to report any harassment towards you or someone else to a trusted adult. Be an Upstander! An Upstander is someone who stands up for kindness and positivity and fights back against bad behavior. Do simple actions to turn negative interactions into positive ones. If someone is being bullied online, be the bigger person. DO NOT retaliate by saying something mean to the bully, but instead get a bunch of your friends and classmates to post positive comments about the person being bullied to change the conversation. Make good decisions when choosing what to say and how to deliver it. If you wouldn’t say it to someone’s face in real life, don’t post it online! Found something negative? Say something! If you come across something that makes you uncomfortable, be brave and tell a trusted adult. Talk it out. Remember that asking for help when someone is being mean or hurtful to you or someone else is smart and brave. Report and/or block inappropriate content. Get proof. Take a screen shot so you have proof about the content you are reporting. Don’t be afraid! If you receive a message, comment, photo, video, etc. from a stranger that makes you uncomfortable, show a trusted adult and then block and report the person. I don’t know about you, but Google’s Family Guide really gave me a lot to think about in terms of discussing internet safety with my daughter, and while I initially thought some of the points didn’t really apply to her, I later realized how wrong I was. Even though she isn’t creating her own passwords and doesn’t have her own social media accounts, she knows some of my passwords, can access my social media channels while on my phone, and can easily read and post content on YouTube without me even knowing. Makes you stop and think, doesn’t it?! The Be Internet Awesome Guide, which outlines the fundamentals and includes links to fabulous tools and resources, including the Be Internet Awesome Curriculum and Be Internet Awesome Pledge. Interland, which is a hands-on, 4-game online adventure that puts the key lessons of digital safety into practice for kids. Family Link, which is a downloadable app that allows parents to review and control how their children spend their time online. Setup takes about 10 minutes, and enables parents to set screen time limits, allow/block app downloads, see the location of their child, and lock and locate their child’s device remotely. *If your kids use tablets and/or laptops at school, consider sharing the Be Internet Awesome Guide and Interland with their teachers to ensure safe internet usage at school as well! I hope these tips and resources inspire you to start the conversation about internet safety on Safer Internet Day – and every day! Here’s to learning how to Be Internet Awesome and raising safe digital citizens. This is a sponsored post written by me on behalf of Google and Forward Influencer. All opinions are my own. 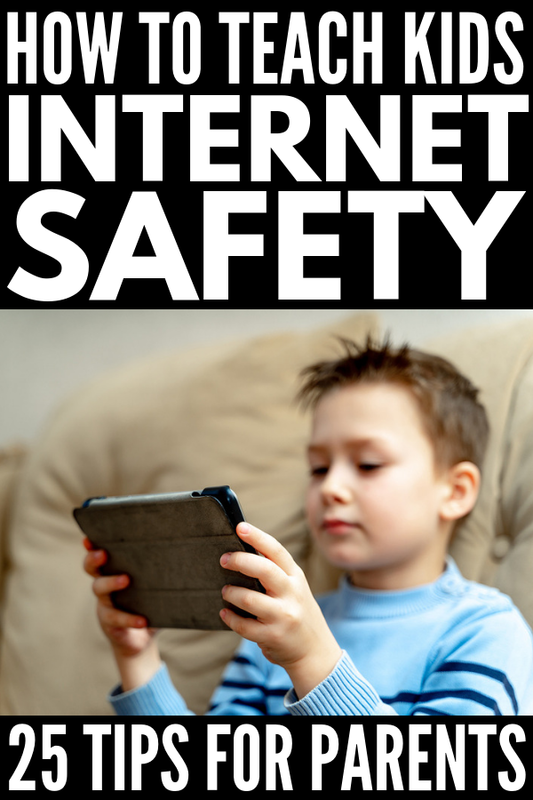 If you found this collection of tips and resources about internet safety for kids helpful, please share this post on Pinterest!